1. You've added an asset which is triggering the crash. You can back the asset pack up if you go to ~/Library/Containers/com.seriflabs.affinitydesigner/Data/Library/Application Support/user/assets.propcol (please attach it here). Once you've made a copy, launch Affinity with the ctrl key held down, check the option for Assets and click Clear. If you don't need the assets, don't worry about backing them up and just go ahead with the ctrl runup. 2. There's an issue that seems to trigger a crash when you click inside certain text fields in a panel. You can trigger this by going to the Guides Manager from the View menu. Add a guide and click inside the field to edit the value. Scenario 1 still crashes (I removed the only asset I have in my assets library and tested again). Scenario 2 crashes for me in the same way - that seems to be the cause. Thanks for the quick responses by the way. Thanks for confirming. Are you using a MacBook Pro with a Touch bar? All the reports so far have one thing in common (besides the crash) and that is that they have a Touch Bar. Right, I'll let development know. If you get any crash reports, can you attach them? We can compare it to the other reports from the different users this has affected and start joining the dots. It's also worth mentioning that I was going to demonstrate this to a colleague but it appears to be intermittent at times - I couldn't reproduce after letting it 'cool off', so there must be some state-specific condition that causes the bug to occur. I wouldn't begin to have any idea what those conditions are, though. I wouldn't spend too much time trying to figure it out—this is really one for us to fix now that we have a few crash reports from multiple users. I'll get this sent to development. Nope, not enabled. And no, no other apps to assist with keyboard input. Thanks Junon. Hopefully, development can still fix this for those of you who don't have it enabled. Still looking for a solution for this. Mine is crashing with both scenario 1 and 2. 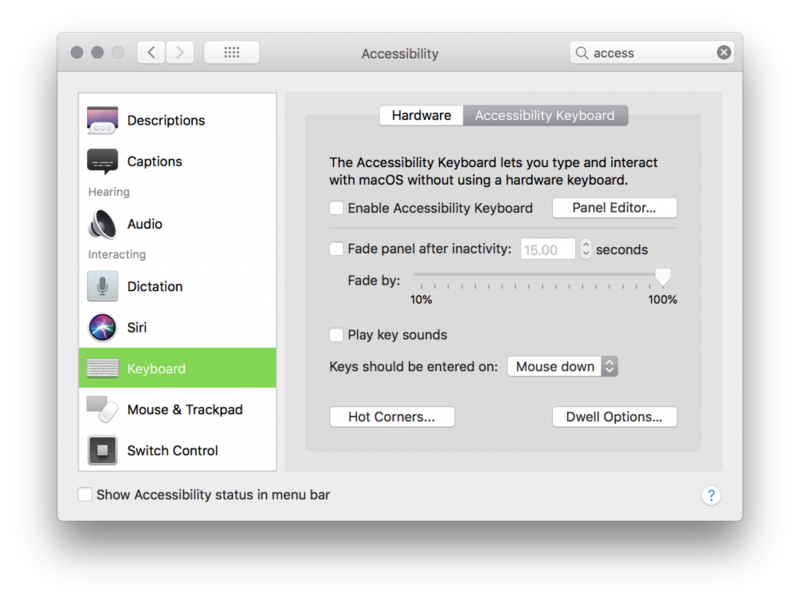 My Accessibility Keyboard is not enabled. I have a Touch Bar. Resetting all settings doesn't fix it. Hey danbru1989, welcome to the Affinity forums. Have you tried the beta? As far as I'm aware, a fix was put into Publisher and that fix should be in Designer and Photo. We've never been able to reproduce and debug it so the developers had to do what they could and rely on user feedback in the beta versions. Thanks for the reply! I looked, but couldn't find any betas for Designer or Photo. Where can I get them? I'm not 100% sure if the fix was pushed to these yet. I haven't seen it reported for the 1.7 beta's so fingers crossed!